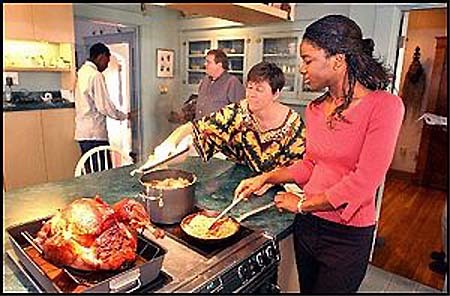 Caption: Nyaniki 'Niki' Quarmyne, 23, a Christian Brothers University student from Ghana, was a Thanksgiving guest at Janet and Michael McCord's home. Nathaniel Kpurubu learned most of what he knows about Thanksgiving from watching American television since he fled Nigeria. The holiday reminds Kayivwambile Siwakwiof the traditional harvest festival back home in Zambia. And Nyaniki 'Niki' Quarmyne celebrated her third Thanksgiving since arriving at Christian Brothers University from Ghana. She believes the custom is afine idea. Everyone has reason to be thankful, Quarmyne said, "because they are alive and well and have seen another year come by." Thanksgiving had a distinctly African flavor at the Midtown home of Janet and Michael McCord and their 8-year-old daughter, Caitlyn. Janet McCord, 48, is an assistant religion professor at Christian Brothers University, where Quarmyne, 23, is an electrical engineering student and Siwakwi, 19, studies computer engineering. Kpurubu, 35, his wife, and their 4-month-old son are McCord family friends. The McCords began growing African roots in the early 1980s, when both went to Zaire - now the Democratic Republic of Congo - as Peace Corps volunteers. In the 1990s they went back, living in Kenya and Uganda. Working in "micro-finance," Michael McCord, 41, helped steer a movement that has helped thousands of poor women become entrepreneurs. Janet McCord, 48, maintains ties to Africa, leading students on research projects in Uganda through a grant program in CBU's Biology Department. Waiting for the Thanksgiving turkey to take its place of honor on the dinner table, Kpurubu said he and his wife fled Nigeria because of government-led murder and repression sparked by demands the Ogoni tribe made for compensation promised decades before when Shell Oil began extracting oil from their lands. Kpurubu, a minister, said the story of Thanksgiving and the pilgrims shows the importance of God as a foundation for the United States. "This country was founded on God and by God," he said. "I think that Americans should thank God that they are who they are today." Siwakwi said Thanksgiving is similar to Zambia's annual harvest festivals. "To speak from my background, it's a time to thank the spirits, ancestors, for allowing us to be here to harvest the fruits, or rather the presents they have given us," he said. I am a Michael McCord. I am a Christian. I have a daughter named Caitlin. I love people from every nation and enjoy that brotherhood/sisterhood fellowship that comes from it too! How cool is that? It has been awhile. How are you all?